Travelcountry.com is excited to announce a new friend we've made! 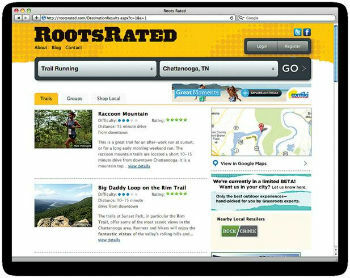 RootsRated is a phenomenal site that we're excited to point people to, because - primarily - it helps people get outside more often, and more efficiently. "Frustrated, while on a nationwide roadtrip, by an inability to find good information for the best local things to do, Fynn was inspired to create a tool that would simplifiy the way people discover and access the most memorable outdoor recreation. Every time he got to a new city, he wished he could ask a local to recommend the best places to go trail running, or kayaking, or rock climbing." So, if you're traveling - or if you are unaware of what is going on in your own city: check out RootsRated. It'll give you an assist to get out and take part in some of the beauty of nature that is around you...wherever you are!